Rammstein are currently gearing up to release their long-awaited new studio album, which is expected to arrive in April. 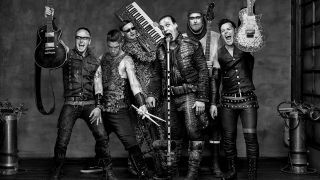 They recently checked in to report they were in the process of mixing the follow-up to 2009’s Liebe ist für alle da, with guitarist Richard Kruspe telling Kerrang that Rammstein were planning on releasing five videos from the as-yet-untitled record. And judging by a new post on Instagram, it would appear that work on the first promo is under way – and it has a religious theme. One of the shots shows frontman Till Lindemann holding a crucifix, while the clapperboard shows the title Black Dog, Big Fish – and it’s being directed by Jonas Åkerlund. Check the pictures out below. Speaking previously about the musical direction on the new album, guitarist Paul Landers told Guitar World: "It’s not too sterile, not too clean – it has a lot of life and energy in it, but it’s not all angry. Rammstein will head out on the road across Europe this summer.